I always enjoy visiting the farm with our pups and watching how the pups react to meeting the animals tells me a great deal about their characters. Before leaving for the farm we did what we always do on all of our training sessions, we carried out a short tracking session at HQ with both pups. Here is Garry doing a short trail where I have laid food drops in my footprints every 3 to 4 steps. As you can see he is already showing excellent concentration and determination just as his uncle Police dog Lenny did at this age. Tracking/ trailing offenders or missing persons is the most important skill for all Police dogs hence the reason we include it in all training sessions. On arriving at the farm brothers Garry and Gunner took it all in their stride confidently investigating the animals but in a very calm and measured way. These two horses were walking by as we arrived and both brothers calmly watched them walk past. Our first port of call was the sheep and lambs. It is very important that Police dogs are neutral to meeting all Livestock because they are often going to be working in rural areas and therefore they should be confident and not distracted working near to all types of animals. With the odd exception our pups are usually confident if not a little excited to start with when meeting the animals but Garry and Gunner were the most relaxed I think I have ever seen pups on a farm visit. Here are the boys meeting Bella. Next it was the calves. Then the boys met Sam. Then finally the chickens and a couple of roosters who are always very tempting for the dogs but yet again the boys were completely relaxed and calm. Our thanks to Simon and Andi pictured here with their son Will and also to Andi’s mum for helping and allowing us to use their farm. RUDY, DEVON, DANNO AND BABY OZ ARE TWO WEEKS INTO THEIR 3 MONTH INITIAL POLICE DOG COURSE AND ARE ALL DOING WELL. Because of all the work put in by our puppy walkers the teams are already at a very advanced level and the dogs are clearly really enjoying the course. Rudy is without doubt the most driven and determined dog on the course. Here is Steve hanging on for grim death as Rudy tracks with fierce determination across country. Just as determined on the agility. His criminal work is going to be very entertaining to watch as we progress to off lead chases and I don’t think many criminals will be able to remain on their feet. Early last week Rudy injured his toe chasing a ball too vigorously and then on Friday Rudy pulled Steve around on his walking line with a bit too much force twisting Steve’s knee. This means that the team will be staying at home this week as Steve rests his knee. Kevin and Devon are doing really well together particularly when you consider that Kevin isn’t the biggest of blokes, he is a first time handler and Devon is a very strong powerful dog. Here they are in the early stages of mastering the agility equipment. Kevin tells me his dad was a professional jockey which would explain Kevin’s position as they negotiate the hurdle. Here they are practising their control work with Devon showing excellent focus towards Kevin. Kevin and Danno have an excellent bond and an excellent working relationship. Here they are performing their control work where their close bond is very apparent. Danno is a little more sensitive than his brother Devon and he is not as driven but he is enthusiastic, biddable and loves to work. After a slow start he now starting to understand what is required of him and the fact that he has a calm patient handler in Kevin they are now starting to make excellent progress together. Ozzie is the baby of the group at 10 months in 5 days’ time. Under normal circumstances we wouldn’t put a dog on an Initial Police dog course before they are 12 months old. But Ozzie is not your normal dog pictured here with Graham doing his control work. Ozzie is a very strong willed dog who is totally fearless. He is perfectly happy as long as he has something to occupy his mind. If not he will make his own entertainment which often includes nipping people in the leg to get the action started. Because of his strong character he has had to change puppy walkers twice finishing with our most experienced puppy walker Lyn Parlour. Unfortunately Lyn has now gone on holiday to Australia and finding a puppy walker suitable for him for a month was a real challenge. So Graham the course instructor volunteered to take him to live with his family and to give him some training on the course. He loves the course and whist we are being careful not to push him too hard because of his young growing joints I wouldn’t be surprised if passes the licensing schedule in December. Here he is in the early stages of his tracking. In my next blog I will give you a more detailed explanation of all the different exercises and disciplines that our dogs undertake during the course. 6 month old Elsa and 7 month old Eva attended puppy class last Sunday and we covered article searching, tracking, bark on command, sit and down stays and getting the dogs walking on a loose lead environmentally. Both dogs are at an excellent standard. Here is Eva showing her natural tracking ability with food drops every 5 paces and a directional change with Lisa handling her. Steve demonstrates a good solid down stay with Elsa. Unfortunately puppy walker Terri wasn’t feeling too well and so Eric didn’t attend our training session. Tag and Tammy are now 12 months old and they are both at a very advanced level as they move towards their Initial course in January 2018. On Sunday we covered Tracking, article searching, an introduction to searching for persons in the open, tugging work and control work. Here is 65 year old Margaret playing tug with Tammy with a vigour that would put some of our younger Police dog handlers to shame. Tags enjoyed playing hide and seek to find where Marina and I were hiding. He was rewarded with his toy for barking to say he had found us. Tag and Tammy are developing into fine tracking dogs. Here is Tag hot on the trail with Marina as always right in the thick of the action. At the end of our session Marina was still keen to do a bit more work with Tag. We had a really enjoyable session and I am very pleased with their progression. At the moment I am spending time monitoring the Initial Police dog course to see how the dogs are getting on and as Oscar and Ollie were due some training I invited them both along. Ozzie now in his 3rd week of the Initial Police dog course was delighted to meet up with his brothers Oscar and Ollie again. In between watching their brother we worked on some tracking, bite work and an introduction to person searching in woodland with Oscar and Ollie. Here is Oscar learning to bark having located a person in the wood. Here is Ollie tracking across country demonstrating determination and excellent focus. I think the puppy walkers of Oscar and Ollie were surprised at just how Ozzie has developed since they all last met and they all clearly enjoyed meeting up again. They really are 3 very impressive males and are a credit to the breeder Richard Evans. For me Dizzy has been the most determined and driven of the D litter pups. She has incredible determination to track, search and bite but she also has a mistrust of people in certain situations. This manifested itself in our boldness tests when she was unable to cope with meeting a person in suspicious circumstances. With time and maturity this could probably be improved but to be a Police dog the ability to deal with stressful situations is very important. Whilst I have no doubt that Dizzy would be very good as a Police dog in most situations she would also find some situations stressful which would not be good for her health and wellbeing. It is for this reason that I have released her. I am very grateful to Mary her original puppy walker and to Lindsay and Anthony for the work they have done in trying to improve this area of her character. Lindsay and Anthony have asked to take Dizzy on as their own dog and I am sure she will be a great dog for them. Here is Dizzy with Lindsay..
We are extremely grateful to Lindsay and Anthony who have previously successfully puppy walked Buddy, Cosmic and Devon for us. During the next 3 weeks I will be travelling to Belgium and Holland to collect 3 male pups to complete our September 2018 intake. In my next blog I will introduce them to you and give you a more detailed account of just what is required on the course for our trainee dogs to become Operational Police dogs. From Ella and me bye for now. From left to right are Steve Newton with Rudy, Course Instructor Graham Attwood with Ozzie, Kevin Roberts with Devon and Kevin Ridger with Danno. Steve is a first time handler from Dorset Police and if successful will be stationed at Ferndown Dorset. Rudy was acquired by me from Tiekerhook kennels in Holland when he was 4 months old and he has been with me since then. I had planned on keeping him as my own dog but as there were only 2 dogs from our D litter ready for the course I made him available to the force. Steve has had Rudy for a couple of weeks to get to know him and develop a bond and is already finding out he is a very lively, determined, friendly and biddable dog born to work. Here he is when I first got him at 4 months. 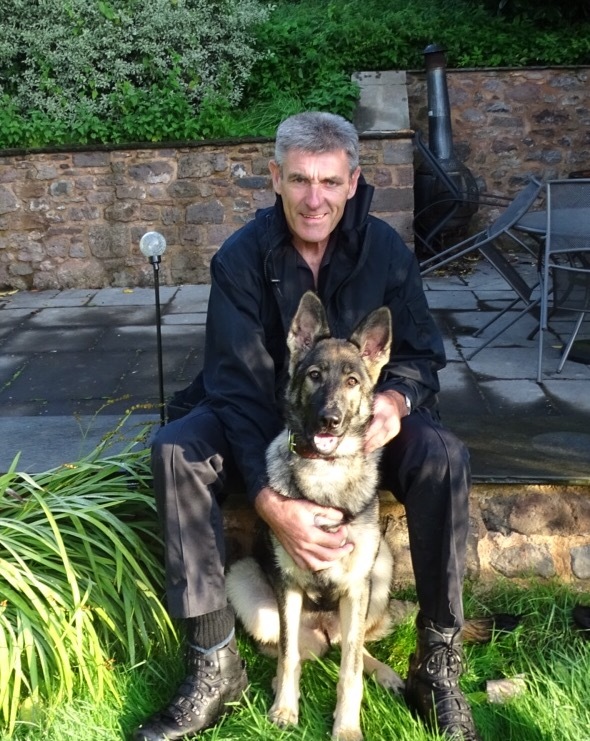 Kevin is the dog section supervisor for Ashburton and Plymouth dog sections. Kevin is also a first time dog handler and has had Devon for several months preparing for the start of the course. Devon was puppy walked by Lindsay and Anthony Lane-lobb in Plymouth. They also previously puppy walked Buddy from our B litter and Cosmic from our C litter. They are currently puppy walking Dizzy from our D litter. Kevin is also a first time handler and if successful with Danno they will be serving at Bodmin dog unit. Danno is from our D litter and is now 15 months old. 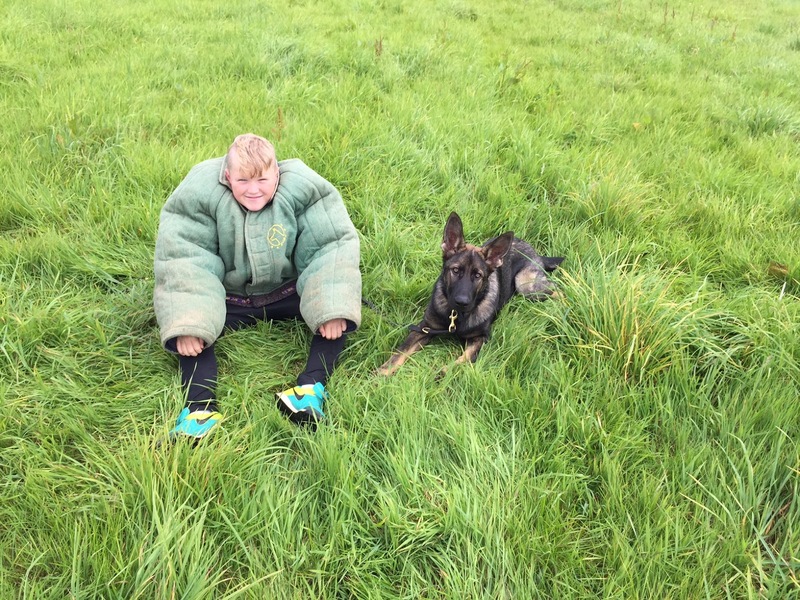 Kevin has been with Danno for several months preparing and bonding with him before the start of the course. Danno was puppy walked by Colin and Mitzi Belsher in Newton Abbott. They have previously puppy walked Beckie from our B litter and Chaos from our C litter. 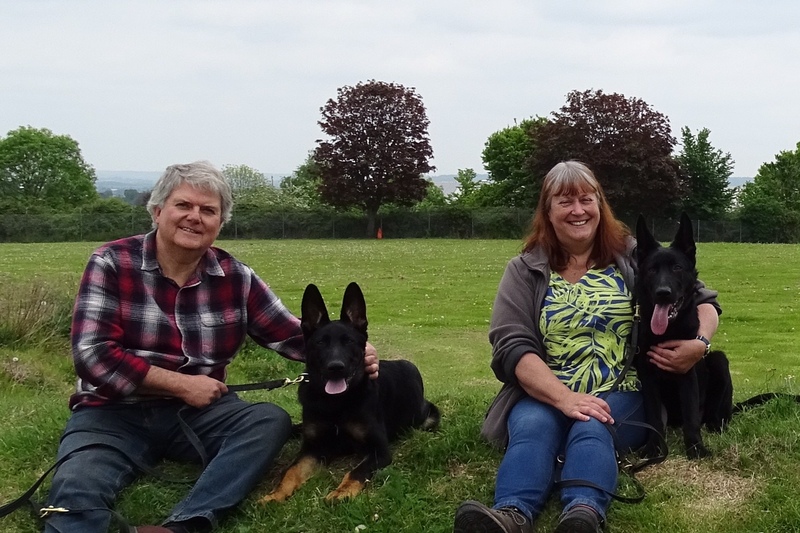 Here they are on one of our training days with Danno. Graham is the course Instructor and will be running Ozzie alongside the other 3 teams just in case he is needed later in the course. Ozzie is too young to start an Initial Police dog course with a handler but because Ozzie’s puppy walker is going to Australia for a month and Ozzie is probably too much of a challenge for a temporary puppy walker Graham has agreed to look after him. Ozzie was initially puppy walked by Marie Broom and her family but after a few months they found him a bit too much of a handful and he went to our most experienced puppy walking family Lyn and John Parlour in Plymouth pictured here at this year’s Devon county show. The course is a very intensive course for both handler and dog. It is very demanding physically and mentally. At weekends the handlers and their dogs will find they sleep a lot but there is one thing for sure the dogs absolutely love all the excitement and action. All 3 handlers are novice first time handlers and they will probably find it is the best course they will ever go on. I usually do several blogs outlining the progress of the teams during the Initial courses but now that the Dog training school have their own very excellent twitter account it may be overkill me also doing a blog. 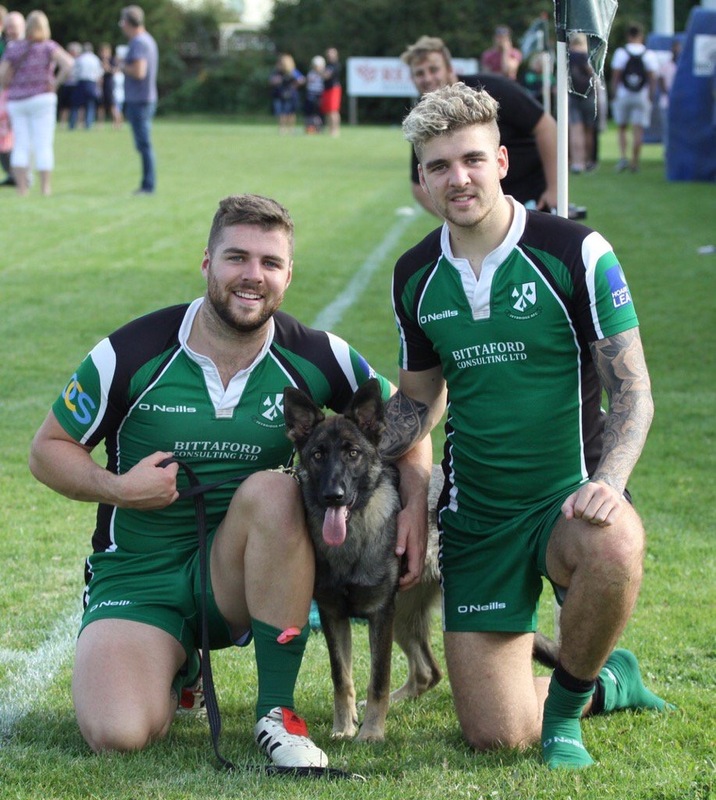 Good luck to all the dog teams over the coming 3 months. What have all the other pups been up to? Oscar and Ozzie come in for some remedial work. Oscar and Ozzie had been very lethargic and lacking drive and enthusiasm on some of our previous training sessions which concerned me. I decided to have a closer look at their working aptitude by having them stay with me for 3 days. I looked at Ozzie first and it was fairly obvious there was no problem with his working aptitude. He just needed to focus and this was easily achieved working one on one with me. He was a pleasure to have. Oscar was exactly the same responding immediately to one on one training with me. He also was a pleasure to have at home. Here he is on this video searching for his toy showing enthusiasm and determination are certainly not lacking. It is hard to believe they are still only 9 months old but they are both super dogs and a credit to the breed and to their breeder Richard Evans. We had a great training day on Sunday 3rd of September despite the heavy rain. We concentrated on our tracking, article searching, criminal work, and person searching in the old HQ traffic building. All 3 dogs are progressing really well and with 4 months still to go before their Initial course in January 2018 these dogs are going to reach an exceptional level. Here are a few Pics of our session. Tag concentrating on following the trail. The girls seem to be enjoying the criminal work more than the dogs. Tammy showing what she lacks in size she has in attitude. On our last training session with Eva and Eric we worked on their article searching, tracking, recall’s and we also carried out an introduction to tugging and leaving on command. Unfortunately there was a malfunction on my camera with most of the photographs but you can see here enthusiasm is not an issue with these two. I was particularly impressed with Eva’s tracking which is as good as I’ve seen in a 6 month old pup. I have also been impressed with Lisa’s handling of Eva which is excellent considering it is her first go at puppy walking. Tristan badgered me to let him wear the criminal work bite jacket. Fortunately Eric didn’t know what it is used for. When Eva isn’t training Lisa’s son Billy (On the left) toughens her up down at the rugby club. 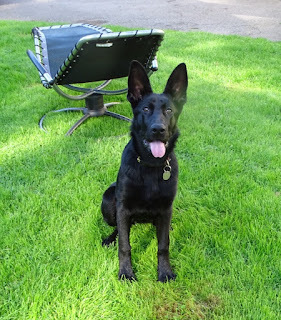 Elsa was unable to attend the session but I looked after her for a few days last week while her puppy walker Steve was away and I was very impressed with her confidence, enthusiasm and determination. When she grows into her ears she is going to be a very powerful female..
Garry and Gunner attended our training session in Plymouth last Monday. We covered Recall’s, Sit and down work, article searching, leaving a toy on command and tracking work. Both Gunner and Garry are natural tracking dogs. Here Isabel throws her toy for Gunner to retrieve . Here is Isabel guiding Gunner onto his track. Here Jill achieves a nice fast recall from Garry. Here Garry and Gunner practise their sit stay. Now that Rudy has left me to start his Initial Police dog course and Sasha is staying with our friends Julie and Les until her next season in January 2018 we only have Ella living with us. It is the first time in a long time that I have only had one dog. This gives me more flexibility to look at other pups in the program if I need to. Ella is giving me tremendous pleasure she is an outstanding dog who just loves life. She is already developing into an excellent tracking dog and I have high hopes for her in the future. Until next time from Ella and me bye for now.